MUMBAI: A small budget film is the only recourse left for many independent filmmakers since most of the big stars have themselves turned filmmakers; thanks to big corporate houses bankrolling their project these stars have nothing to lose. Blood Money is one such small enterprise from Bhatt Brothers who have alternated between some successful and some dud small films. For a small film where the face value of actors is limited, a taut story and narrative are mandatory; Blood Money can‘t claim to have any of these. 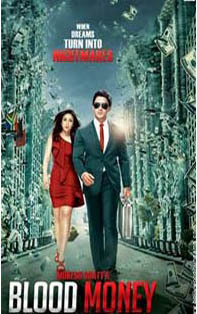 Producers: Vishesh Films, Viacom 18 Motion Pictures. Cast: Kunal Khemu, Amrita Puri, Manish Choudhary. Kunal Khemu, a middle class Mumbai lad lands a job with a huge diamond trading company in South Africa where he arrives with his wife, Amrita Puri. A palatial bungalow awaits him. Since film scripts are very accommodating, Khemu wins over his boss, Manish Choudhary‘s heart as well as confidence instantly, so much so that even boss‘ brother is jealous of him. As Kunal Khemu scores one success after another in business deals, though one does not know why a top rated diamond company would be selling in retail to individual customers across office counters, he is soon promoted now having a huge personal office cabin as well as a secretary. Amrita Puri is not quite comfortable with all that is bestowed on her husband by his boss and she cites the fairy tale of Hansel and Gretel about a witch luring a brother- sister duo into a house made of cakes and confectionaries with an intent to eat them up. Taken in by his heady ride to success, Kunal Khemu falls prey to an office girl who seduces him during an office party resulting in Amrita Puri walking out on him; the sequence is out of place and irrelevant; if it is meant to add emotions to the story, it fails miserably. Finally, it is time to give the story some reason and an Indian perspective. Sent on an errand to Angola, Kunal Khemu finds out that he has been used by his boss for delivering arms and explosives to some Abu Hamza, a dreaded terrorist; the meeting takes place at what looks like a diamond mine surrounded by weapon wielding heavies and Abu Hamza sits on a wooden desk the kind shown in Hindi films for a munshi at a construction site. Hardly terrorising for effect! It is time Kunal Khemu confronted Manish Choudhary since he is a man on mission and that is his assignment. A weak story with treatment so poor, Blood Money does not even have ingredients like action, music or comedy to fall back on. Kunal Khemu can‘t do much in a role that lacks substance, Manish Choudhary is good. Amrita Puri is okay. Blood Money is one of those duds from Bhatt Brothers.